Too often, painters suggest that ceilings just be painted “Ceiling White”. While this may be in the best interest of the painter, it rarely is in the best interest of the client. It saves the painter a few seconds if they can come into a paint store, and just have a can shaken, without having to have it tinted. But “Ceiling White” is typically a blue gray white, with the potentially of feeling very cold. Unless you are painting a room in a blue-gray hue, it is not the best choice. At Benjamin Moore, every color can be created in the Waterborne Ceiling paint, Benjamin Moore’s ultra-flat choice for ceilings. The flattest paint Benjamin Moore makes, it hides the most imperfections. If you have fair skin, and like white ceilings, consider Atrium White, or AF-10 gardenia. These are whites with a drop of red in them, giving a rosy light in which every fair skinned person will look very healthy. If you prefer warm yellow-based wall colors, consider Simply White or AF-20 mascarpone for the ceiling. Both have a drop of yellow in them, but still appear white. Mascarpone is a little creamier than Simply White. The next creamier color after AF-10 mascarpone is AF-30 deep in thought. If you want to soften the ceiling but do not want a yellow light or pink light reflected from the ceiling, AF-15 steam is a white with one drop of brown in it, and gives a softened warm ceiling without being yellow. Need it just a little less white or browner? Try AF-45 Collector’s Item. The same principle can be applied to other brands of paint. But if your trim color is creamier and not white, you may need even more contrast on the ceiling. Higher contrast colors which are a perceived color other than white also work well in ceilings, and can make a ceiling feel higher, much like the night sky. We know that dark canopy of stars above us at night is far away. In the same way, a deeper value of paint color on the ceiling can make a ceiling soar, as long as there is also sufficient light in a room. More contrast on a ceiling can add warmth to a space, and increase the impact of crown moulding. Don’t underestimate the importance of ceiling color. The blue-gray cast of a basic “ceiling white” can make almost any wall color – other than blue-gray- duller and even muddy under low light conditions. 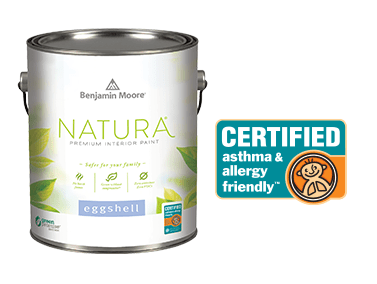 Benjamin Moore just released information of interest to any family coping with allergies or asthma. Here is a copy of the release. Natura can be mixed in three finishes, flat, eggshell, and semi-gloss, and in all of Benjamin Moore’s color collections but one (the Color Stories collection can only be mixed in Aura.). Benjamin Moore’s first paint to earn the certification. For more information about the asthma & allergy friendly™ Certification Program, please visit www.aafa.org/certified. *U.S. Center for Disease Control and Prevention 2013 Statistical Updates; World Health Organization, Asthma & Allergy Foundation of America. ** Zero VOC according to EPA Method 24. No VOC emissions detected according to CDPH/EHLB/standard method v1.1. 2010.